Pasta Puttanesca is a super easy heat-n-eat dinner. 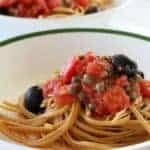 Loaded with the delicious flavors of tomatoes, olives, capers & anchovies, everyone likes it. Add olive oil to a large, heavy-bottomed saucepan over medium heat. Add garlic, oregano, crushed red pepper and anchovies, stir to break up anchovies, cook 2-3 minutes. Add tomatoes and bring mixture to a boil. Reduce heat and simmer 20 minutes. Stir in capers and olives, cook 5 minutes more.